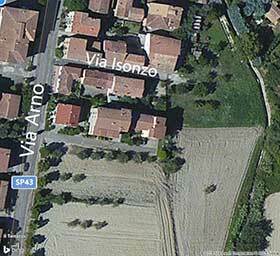 The Bed and Breakfast is located in the highest part of Sferracavallo, a small town located about 1 km from Orvieto. It has the back to the rest of the country, "the terrace" overlooks the countryside at the foot of the cliff, it is topped with the oldest part of the city. In the evening, the view from the "balcony" seems a little crib. "White room" an intimate bed room with private bathroom and breakfast. The Bed & Breakfast has all comforts, Wi-Fi, heating and fans. 30 meters from the Bed & Breakfast there is the bus stop for those unwilling to go into the old town of Orvieto with the car, leaving their vehicles in the parking lot in front of the Bed and Breakfast, or a parking called "Foro Boario" to one km from the bed and breakfast and you are in the center going up with the suggestive escalators that is a first taste of underground Orvieto, or lift. For breakfast, at your arrival you will be asking by the B&B's holder about your preferences and timing, like an Italian breakfast (milk, coffee, tea, juice, cookies and biscuits, jam and butter, croissants with cream pies at times and / or ciambelloni) that will be carried out on the terrace in summer and in the room in winter. The room is equipped with a comfortable table, towels set, the courtesy kit and hairdryer and it has the ensuite bathroom with dressing room entrance and a wet room. The Cliff side, on which Orvieto stands and which rises up above the medieval region can be seen from the "terrazzo" of the house. 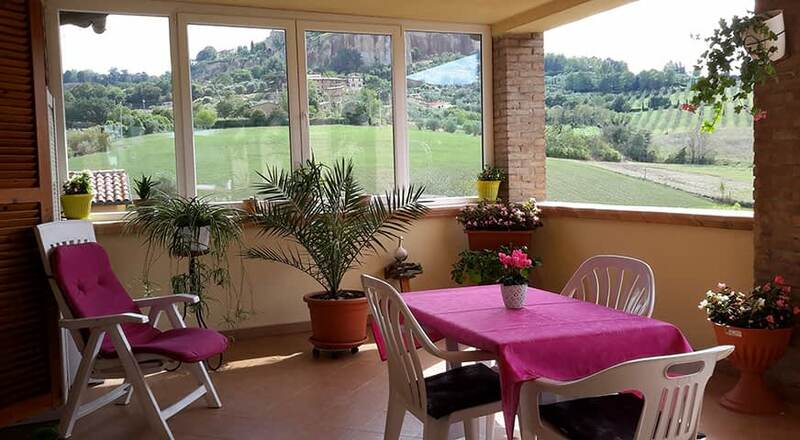 The B&B is placed to the feet of the Cliff of Orvieto and is distant 1 Kilometer from the historical center, attainable also from elevators or from mobile staircases obtained inside the rocky mass. Some images of the Bed & Breakfast and from the Bed & Breakfast in Orvieto demonstrates the brief distance to the Cliff. It is also called this way: La Rupe. It is really what it is, a block of rock that suddenly jumps out of the lowland, without warning and with vertical walls. It formed around hundred thousand years ago, when a dreadful eruption deposited layers of volcanic earth and volcanic rock and then....the water and...the time....did the Cliff. How to reach our B&B with Google.